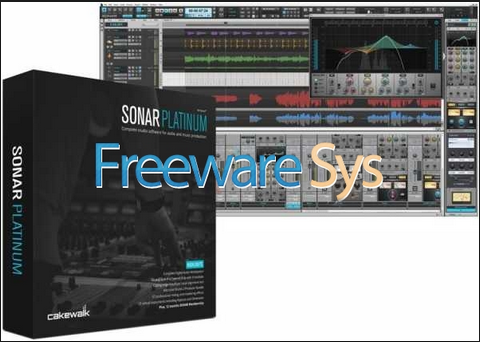 SONAR is more than just a digital audio workstation - it's the most advanced music production environment available today. Choose the creative experience only SONAR offers: advanced technology, effortless workflow, and an inviting interface that amplifies inspiration. Capture pristine recordings in the award-winning, touch-enabled Skylight User Interface-then take advantage of the comprehensive editing, mixing, mastering, and publishing tools to craft your masterpiece. Create that huge, luscious studio drum sound inside SONAR Platinum with Drum Replacer-the brand new, ARA-integrated plug-in for enhancing drum productions. Extract drum hits from loops, drag in your own samples, reinforce your drums, and a lot more-all with zero latency, thanks to flawless ARA/SONAR integration. VocalSync tightens vocals by aligning one part to another-and it's essential for matching dialogue to picture, synchronizing background vocals, and tightening doubled vocal parts. Use VocalSync to perfect your parts' timing without splitting and moving clips. VocalSync is part of SONAR's Region FX workflow-so you can process and edit multiple dub parts to a single guide track, all within the fluid workflow of SONAR's award-winning Skylight interface. Never second-guess yourself on a mix again. Mix Recall lets you save and switch to various mix scenes for easy, one-click comparisons. Swap out effects, fader positions, or every parameter so that you can restore an original mix, create remixes, or just entertain a client's suggestion. Mix tracks specifically for radio, podcast, video, or mp3, and then bounce every version in a single export. No MIDI controller? No problem. The Onscreen Virtual Controller lets you compose with all of your favorite virtual instruments with absolutely no MIDI hardware connected to your computer. It also supports mouse input and QWERTY keyboards so you can type MIDI compositions right into SONAR, jump octaves, and even adjust velocity without a touch screen. What's more, a special piano for touch-enabled devices snaps automatically to the screen resolution size. New detection algorithms re-boot AudioSnap into a next-generation toolkit. Stretch a song from one tempo to another, sync your recordings to audio loops, tighten your drums and convert them to MIDI.and the new level of performance comes wrapped in a new look and new layout. SONAR includes the world's finest drum kits and percussion instruments. SONAR Professional includes the Addictive Drums 2 Solo bundle, which lets you pick any ADpak, any MIDIpak, and any Kitpiece Pak of your choice. You'll have tons of inspiring new sounds and rhythms for your next masterpiece. SONAR Platinum includes the Addictive Drums 2 Producer bundle, which lets you choose any three ADpaks, any three MIDIpaks, and any three Kitpiece Paks. This is perfect for producers and music creators who work in a few different genres, because you can pick the content that covers your exact needs-you'll have great drum sounds no matter where your inspiration takes you. From country to metal, bass to funk, classic rock to futuristic, SONAR's 16 new drag-and-drop amps aren't about emulating existing amps-but creating idealized amps that can exist only in the virtual world. Get ready to change how you look at amp simulations. The only variable separating you from your creativity is time, and the Pattern Tool-which sits in the Smart Tool palette for instant access-is all about saving time. Forget cut and paste: Simply select and paint MIDI loops and patterns across the Piano Roll View and Track View. While working on Drum Replacer, we realized that we could make improvements and fixes to our ARA support for Melodyne. As a result, this release now improves on Melodyne's seamless integration inside of SONAR. SONAR now incorporates a new architecture for MIDI note management in software synths, because certain soft synths require an exact match of Note-On and Note-Off messages- insufficient Note-Off messages can lead to stuck notes and reduced voices on samplers. SONAR now explicitly counts all Note-On messages and issues an exact number of Note-Off messages to each synth when using transport functions. Everyone loves more options - which is why Platinum, Professional, and Artist users can now import/export Ogg Vorbis, RF64, and over 20 other audio formats for compatibility with the very latest (as well as legacy) audio formats. In addition, MP3 Export has also been improved in this release. כל הזמנים הם לפי GMT +3. השעה כרגע היא 00:25.